Gents, are you getting ready to pop the question to that special girl in your life? Ladies, do you want to give your future fiance a nudge in the right direction regarding your engagement ring preference? Brilliance matches different kinds of engagement rings with different kinds of personality types for the perfect fit that will last a lifetime. A yellow gold kind of girl? Chances are, you have a vivacious personality and have a whirlwind of a social life. If you have a warm skin tone (you can check your wrist for greenish colored veins), yellow gold is your best bet for a great jewelry metal match. 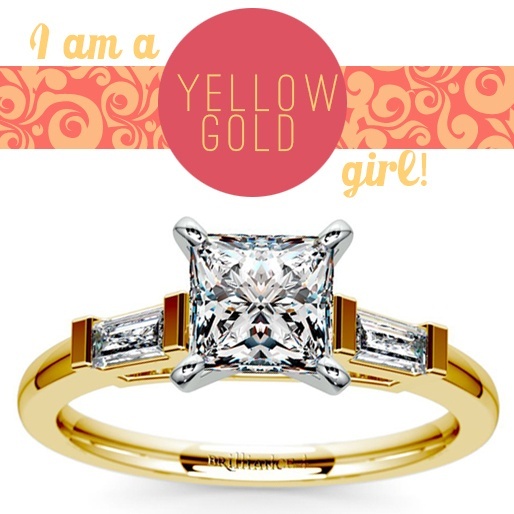 Natural blondes or redheads will also look great wearing engagement rings with yellow gold bands. 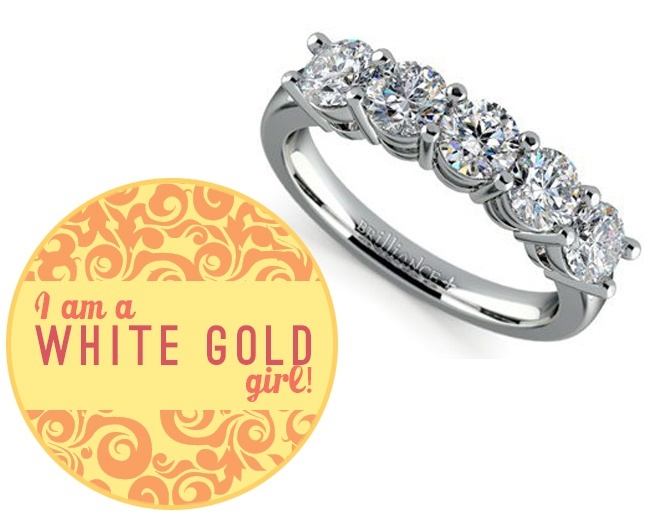 …or a white gold kind of girl? White gold is a good choice for those who like their jewelry timeless and understated. It is also the best kind of precious metal color for people with cool skin tones (look for blue-toned veins on your wrist, or a rosy undertone to your skin). Skin that tans easily is considered cool-toned. A wardrobe filled with classically tailored clothes and not a lot of faddish ones will also go well with a white gold engagement ring. 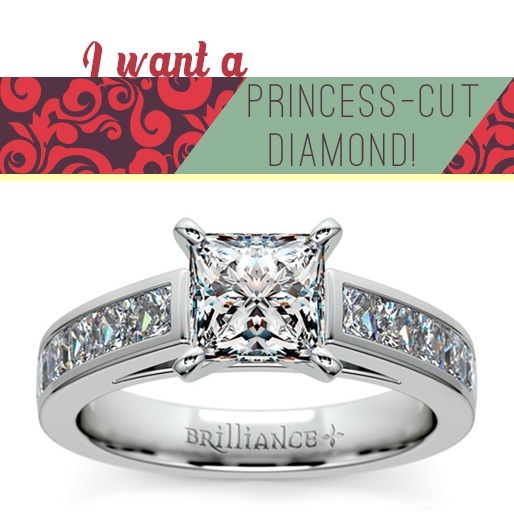 The “Princess” part of this particular diamond cut should already be a giveaway. It is of a squarish shape, with corners angled to have maximum light refraction. The kind of sparkle which the Princess-cut engagement ring provides will definitely allow the wearer to feel like royalty. Princess-cut diamonds are also associated with independent, self-confident women. 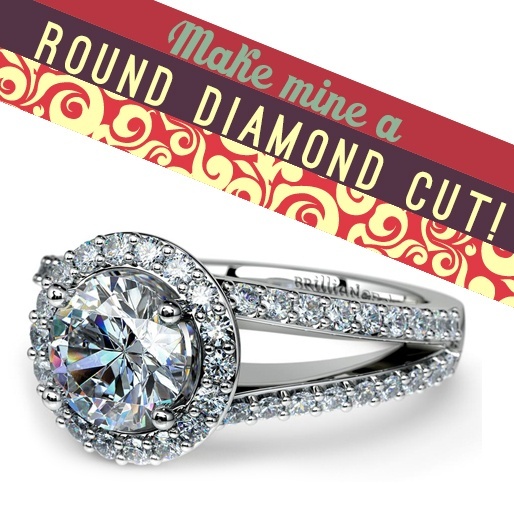 Raving over the round diamond cut? Considered the most classic diamond cut, a girl who likes her clothes, jewelry, and accessories transcending time and trends will most likely go for this kind of engagement ring. It is the diamond cut that typically make up the lion’s share of sales in many jewelry stores. In fact, any other kind of cut that isn’t a round-brilliant is also referred to as “fancy cut”. Ladies who have a warm, dependable, and friendly personality deserve a round diamond engagement ring. Asking for an Asscher cut diamond? The Asscher cut, invented in 1902, has a squarish shape almost similar to an emerald cut diamond. It also features cropped corners which gives it a sort of octagonal look. This is to ensure maximum clarity. 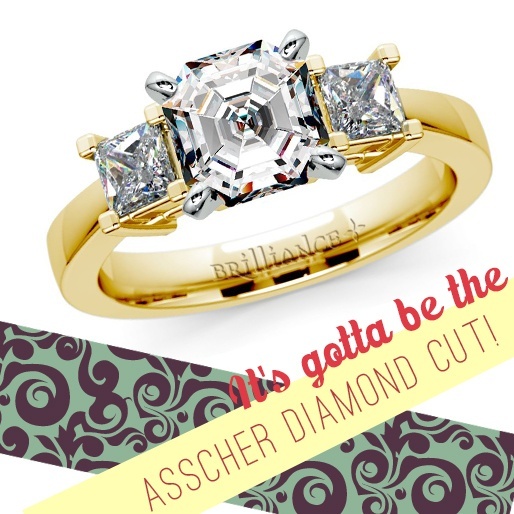 Those who like vintage-looking jewelry will likely fall for the Asscher-cut diamond. Art Deco-inspired engagement rings feature this kind of diamond cut, and it will suit dramatic and flamboyant personality types. 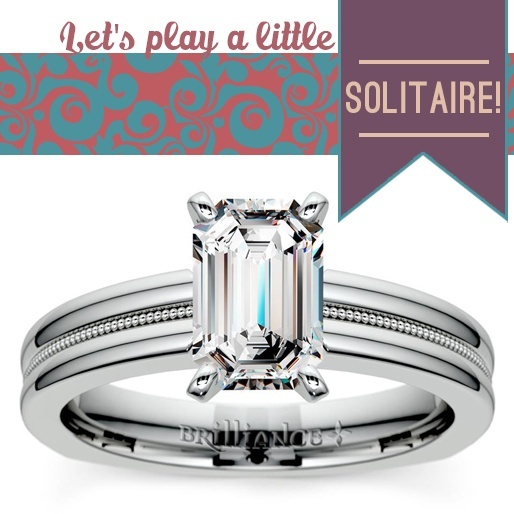 Got a soft spot for the solitaire diamond? The solitaire diamond engagement ring has been the preference of many newly-minted fiancees, and the gents who proposed to them, of course. This very popular setting has a quiet elegance that can withstand all sorts of jewelry fads. It features a single diamond, but the wearer’s personality can influence its carat weight, type of precious metal, shape, clarity, and other factors. However, those who lean towards sedate jewelry pieces and prefer dateless designs typically choose the solitaire setting. 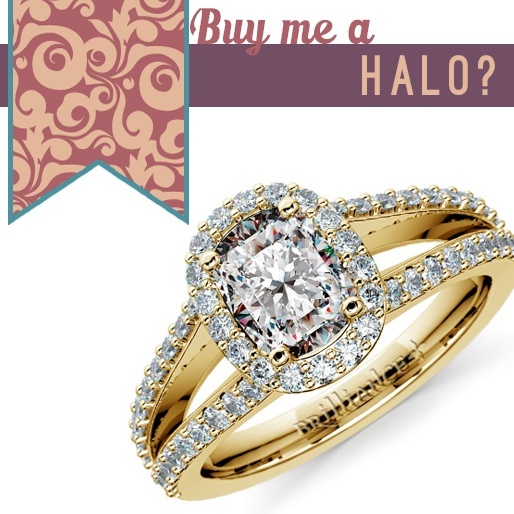 The Halo diamond cut is fast becoming a favorite among celebrities and socialites. It features a center diamond with its own aura of smaller diamonds. While many may tend to think that more than one diamond on an engagement ring is ostentatious, a halo setting can also look classic, especially when worn with tailored clothes. It speaks of restrained, good taste as well as a preference for timeless luxuries in life. Paving the way for a pave setting? 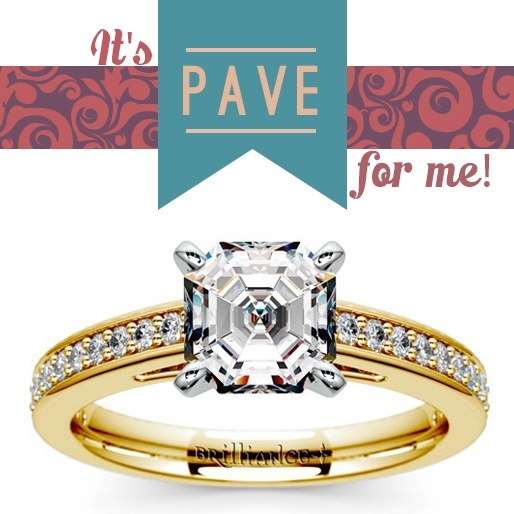 The pave setting for engagement rings are usually a hit with those who like the finer things in life, and have a keen eye for fashion. Small diamonds form a halo around a central stone, and go around the precious metal (as with paved stones on a path). High-profile future brides typically prefer this kind of setting, although more sedate versions of the pave engagement rings will also suit ladies who can appreciate its beauty.